The 7MS is an audio driver designed for the dedicated music lover and High-Fidelity enthusiast. Attention to design detail along with an close tolerance manufacturing standard to +/- 0.05mm on most component alignments make this new generation of Markaudio transducers stand out from the crowd. The wideband driver with better dispersion. After releasing the Pluvia range of drivers, which have been well received, Mark set about the next design evolution. As some of you will know Mark’s design ethos is mechanical efficiency, adding lightness and simplifying where possible. In these new drivers Mark has managed to achieve much more with much less. New technology Full Range audio driver. The advanced design Alpair 7MS (mono suspension) is a radical departure from previous models. The 7MS is completely new, utilising many new design components and manufacturing processes. The two main features are the patent-pending Negative Camber Cone and Mono suspension system. Other key features include a custom designed, gas-flowed glass-fibre chassis and dedicated ultra light voice coil. Negative Camber Cone (patent-pending). The 7MS cone is an ultra shallow design affording a wide dispersion pattern. The outer section of the cone profile is angled backwards creating a +180 degrees emittance pattern to help optimise stereo imaging. 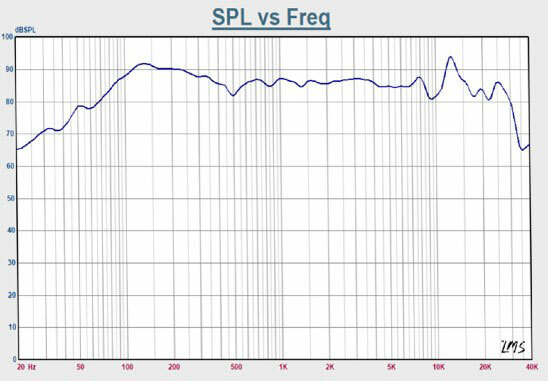 Vocals from quality sources sound more natural and detailed as the central cap and cone profile are geometrically close-aligned. Mono Suspension (patent-pending). Much technical research has been done to balance the driver’s powertrain (cone, cap, coil and suspension) between its axis of travel and the corresponding centre of gravity. The new negative-camber cone facilitates the repositioning of the coil to avoid the need for a traditional rear suspension (spider). This new mono suspension design frees the coil from having a restrictive spider bonded to it, improving the transfer of energy from the driver’s motor to its cone. The new suspension employs an all new custom mix of four synthetic materials, resulting in improved linearity under low frequency loads. The 7MS all new chassis is optimised to enhance airflow. 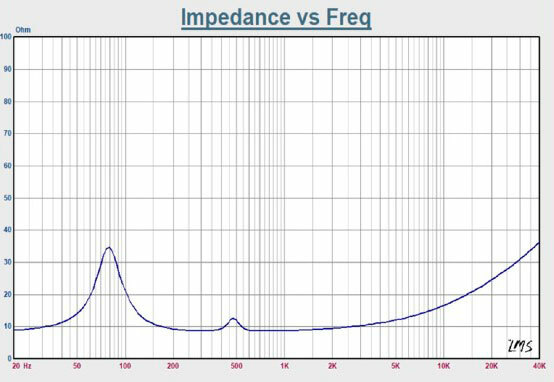 The various slopes and rounded angles help improve sound wave emittance. Custom extended terminals are provided for push-on connectors or light-soldering for cables up to 1.5mm diameter. The run-in time for the 7MS is significantly reduced compared to previous models. Ten hours of light music at moderate volumes is sufficient for the suspension to reach its optimal operating pattern. An Arrestor (as deployed in previous Alpair models) provides an audible warning of accidental excess excursion. 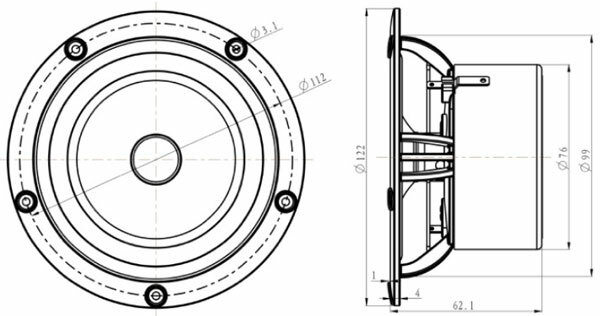 The low-mass coil has a vented former and the motor employs custom made copper plating to reduce distortion. The MS7 is a bass capable audio driver with comparable performance to light-medium load traditional mid-bass units of the same size. Please note: Small to medium sized speakers are usually lower power designs. 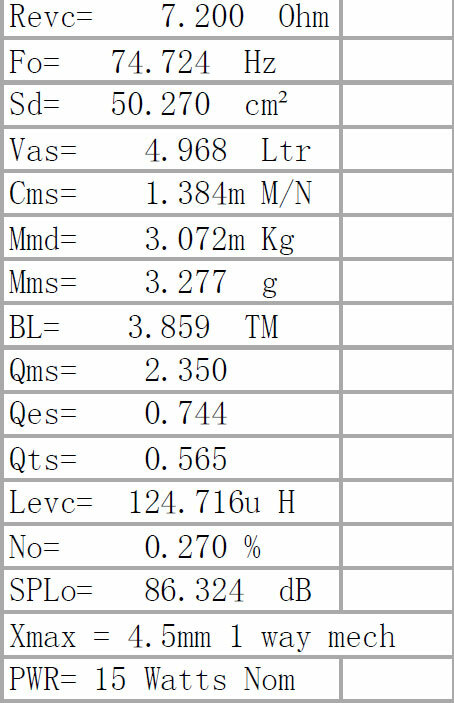 The power rating is given in the technical data for each audio driver. For a reliable long service life, please operate your new speakers with care. For the first 100 hours, operate them at very low volumes. After this period, gradually increase the volume to a normal listening level. If you see the cone of the speakers making large movements, immediately turn the volume down. This will protect the speaker and your human hearing from damage. Factory mechanical defects for a period of 1 year. Excessive hard use (over-driving) and other damage caused during customer use is excluded from our warranty.